The university city of Oxford is a beautiful and compact city, full of medieval gems, historic buildings and one of the most highly regarded universities in the world. Oxford is also home to an upbeat mixture of shops, bars, cafés, restaurants and clubs. Throughout this city you will find large pockets of green, including spacious parks, landscaped gardens and a scenic canal, with a number of popular punting stations, filled with excited holiday makers during sunny summer days. Oxford really does thrive on tourism and makes every conceivable effort to encourage and welcome visitors. There is easily enough here to fill an entire week, although if you are in the city just for the day, it is worth boarding an open-top sightseeing bus and taking the grand tour. Much of central Oxford is surrounded by rivers and small streams, with Carfax Tower making a good ponit of reference, along with St. Aldate's Street. Broad Street is where you will now find the official Oxford Tourist Information Centre (TIC), which stocks a useful free brochure, complete with self-guided walking tour. Wherever you choose to stay in Oxford, it is likely to be a little on the pricey side of expensive. Popular areas to stay include Abingdon Road, Banbury Road, Bath Place, Beaumont Street, Cornmarket Street and Park End Street. For cheap B&Bs and similar guest houses, head to the eastern side of Oxford, where Cowley Road and Iffley Road are safe bets. Headington Road is also worthy of consideration and is within convenient strolling distance of the New High Street. Attractions in this alluring city include the Oxford Story - allowing you to explore and experience the sights and sounds of the university's early beginnings, with one of the largest indoor 'dark' rides in Europe; the Oxford Walking Tour - providing a most interesting way to sightsee in the city; punting on the River Cherwell - an appealing and relaxing pastime; the Bridge of Sighs - an extremely beautiful landmark built in the early 1900s, connecting the University Hertford College buildings; and the Botanic Garden - home to more than 7,000 different plants from all over the world. Other historic landmarks include Christ Church Cathedral - with classical architecture, a tall church spire, large circular columns, rounded Norman arches and a vaulted ceiling; St. Michael at the Northgate - found in central Oxford and amongst the oldest buildings in the city, dating back almost 1,000 years; the Sheldonian Theatre - featuring impressive, round, Roman-style architecture and many important concerts; the New Bodleian Library - one of the largest libraries in the world, featuring a total of 11 floors, underground areas, more than five million books; the Radcliffe Camera - built over 250 years ago and now housing the main reading room in the Bodleian Library complex, with underground rooms holding around 600,000 books; the Tom Tower - designed by world-famous architect Sir Christopher Wren, home to the largest bell in the Oxfordshire area; and the Carfax Tower - built almost 800 years ago and originally part of St. Martin's Church, providing spectacular panoramic views of the cityscape. 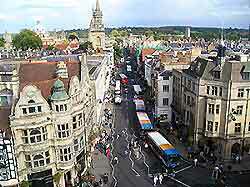 More information about Oxford Tourist Attractions and Oxford Landmarks. 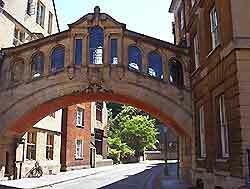 Oxford also has a number of attractions suiting those with a taste for culture. These include the Oxford University Museum - full of natural history information and exhibits, such as dinosaur skeletons, an impressive collection of stuffed animals, geology displays and local artefacts; the Pitt Rivers Museum - with an enormous number of collections, such as historic weapons, religious artefacts, prehistoric finds, amulets, ancient jewellery and musical instruments; the Bate Collection Museum - one of the largest collections of woodwind, brass and percussion instruments in the United Kingdom; the Ashmolean Museum - housing spectacular collections of important archaeological finds and memorabilia; the Museum of the History of Science - with an unrivalled collection of interesting, scientific instruments dating back to the 18th century; the Oxford Museum of Modern Art (MOMA) - home to a wealth of modern art, including paintings, sketches, sculptures, pottery and photography;and the Christ Church Picture Gallery - a very highly regarded traditional art gallery. Oxford University is one of the world's leading educational institutions and actually consists of 39 separate colleges, located in and around the city centre. Many of the famous Oxford University colleges are open to the public on official walking tours or on an individual basis, and these spectacular historic buildings deserve to be seen close up. 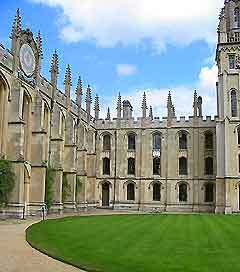 The main colleges include All Souls College, Balliol College, Brasenose College, Christ Church, Corpus Christi College, Merton College, New College, Nuffield College, Pembroke College, Queen's College, St. Anne's College, St. Catherine's College, St. Edmund Hall, St. Hilda's College, St. Hugh's College, St. John's College, St. Peter's College and Trinity College. There are many major attractions nearby Oxford, including Blenheim Palace, the Vale of the White Horse, Mattocks Rose Garden, Waddesdon Manor and Cotswold Wildlife Park. 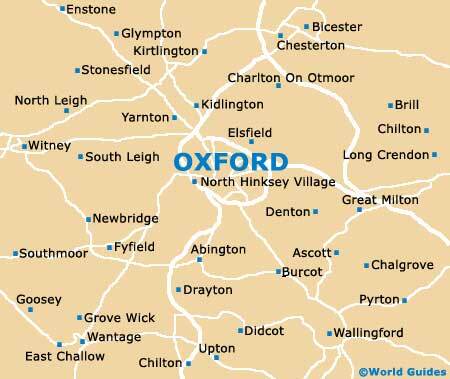 Oxford is also within easy reach of numerous market towns, picturesque villages and important cities, including the English capital of London. Oxford is predominantly a university city and much of its overall wealth and appeal has been derived from its vast network of colleges. Employing over 7,000 people, almost ten percent of the city's total workforce, Oxford University has a major contribution to the overall economy, as well as tourism. Each year, more than four million people visit the city's university buildings, churches, libraries, gardens and parks.